This year, like every year, Christmas time has been hectic but filled with fun. We have endeavoured to keep up the many traditions started in past years and even added a couple of new ones I have gathered from other Mums to add to our family repertoire. Here is a mega list of all of the ideas, including those we do ourselves and some we like but simply cannot fit it in just now. 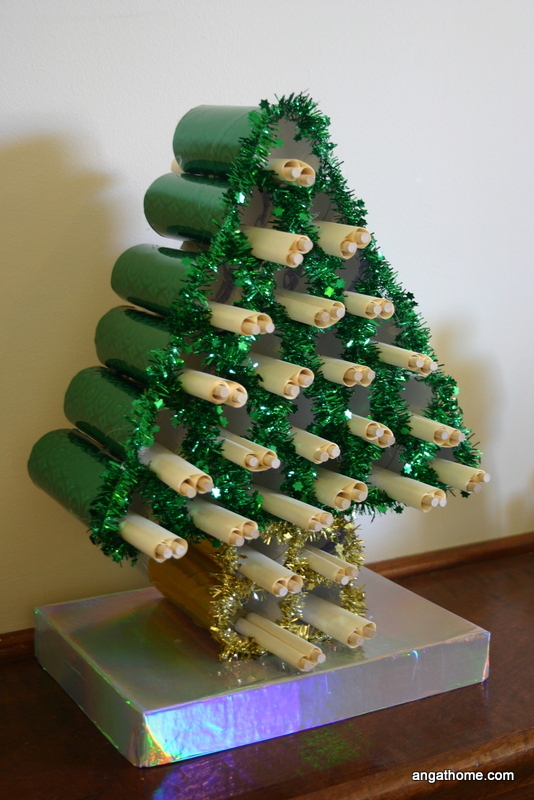 This pretty tree is made from toilet rolls covered in contact paper and hot glued together. We use it to keep the scrolls with our daily bible readings to go along with the Jesse tree symbols. Each morning the children take turns to open a door on our wooden advent calendar. Each little box holds a character from the nativity and occasionally there is a surprise treat to share. The characters are magnetic and are added to the scene above the boxes to eventually complete the nativity story. The child opening the box that day is allowed to arrange the characters however they wish, which leads to some interesting nativity set-ups! Every evening the advent wreath and candles are lit while we read our advent story. This year it is Jotham’s Journey. It is written in small instalments with the story of Jesus’ birth as a background to fictional events and includes a short life lesson following each day’s reading. Each evening finishes on a cliff-hanger that leaves the children begging for more. 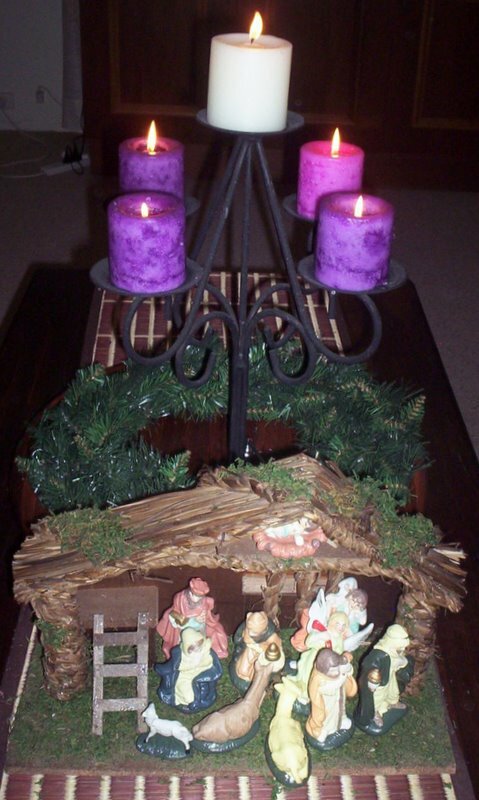 Our advent wreath and one of the nativity sets. We have several nativity scenes set out for little ones to play with; a china set for the older children and fabric and wooden sets for the little ones. We plan to add to these each year in the after Christmas sales. In the after dinner rush to get PJ’s on and teeth brushed and be ready for our Advent story, those who are done play quietly with the nativity sets or browse through the Christmas books until the whole family is together. The advent candles are lit and tree lights turned on while we cuddle up and read together. Christmas worship music and carols are playing in the house often throughout December, especially during craft activities. We attend a Carols in the Park each year with candles, animal rides, picnic dinner, snacks, deck chairs & blankets. Singing songs about the birth of Jesus under the stars with family and friends is one of the highlights of the season for the children. The Road to Bethlehem is another evening event we now attend yearly. Put on by one of the local churches, it is a walking tour/play/production depicting the biblical Christmas story. It is extremely well done and it never ceases to amaze us that they have a brand new baby in it every year. 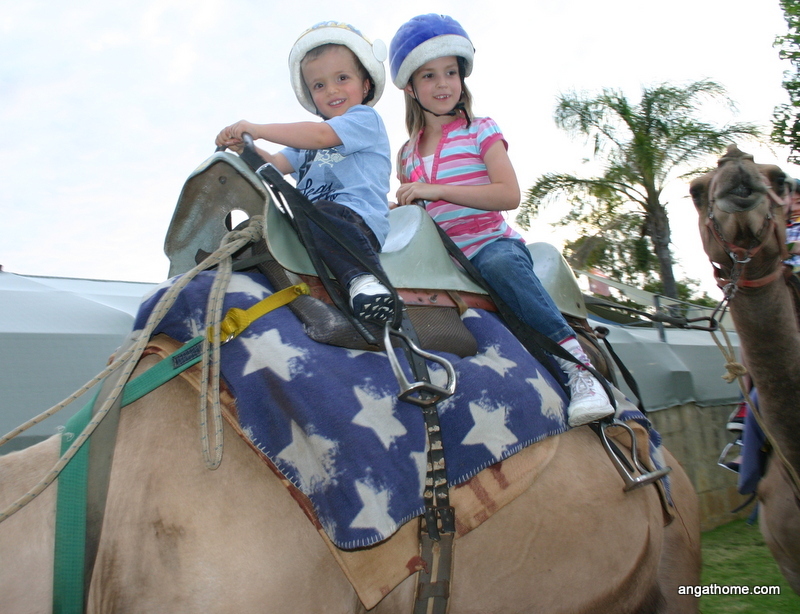 The camel rides are a highlight too. I am gradually building up our set of Christmas books and now have quite a stack wrapped and under the tree for our Christmas picture book advent. The children take turns choosing one story to unwrap and read each day. We also have a couple of Christmas videos for those afternoons following late night activities when more down-time than usual is called for. Each year we look for ways to give “gifts for Jesus” by blessing others. Church Christmas hampers, shoe boxes for Samaritan’s Purse Operation Christmas Child, choosing a Compassion gift of a water well etc. or giving gifts to local charities for underprivileged children are some of the ways we have done this. Friends of ours like to get a group together (friends/neighbours, Mothers and daughters etc) to make gingerbread houses. They buy kits from large department stores/Ikea etc plus bulk lolly decorations. This year we are experimenting with making our gingerbread house kit into a nativity scene instead. It remains to be seen whether it will be a success or not! Last year’s gingerbread house. 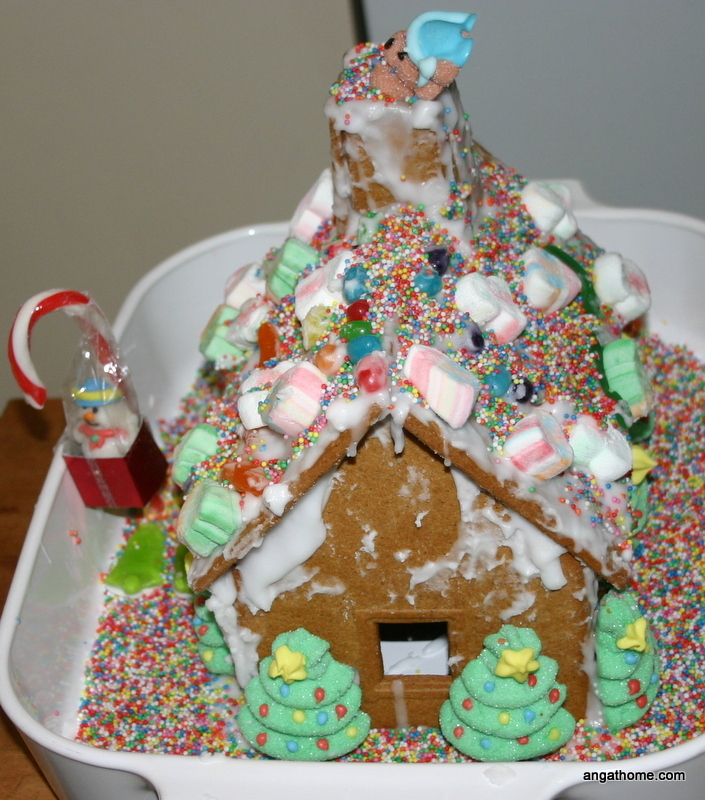 We are given a lot of lollies around Christmas and in an effort to avoid the sugar, we saved them up and used them to decorate the gingerbread house we were given as a gift. We took it with us to contribute to Christmas day lunch and share with extended family. It didn’t come home again! Perhaps the children (of one family or extended family) could rehearse and put on a nativity play for Daddy and extended family. Jesus’ Christmas Party by Nicholas Allan lends itself well to a simple yet humorous retelling. Those who play instruments could perform or any other talent (serious or humorous) could be showcased for the family’s enjoyment. Take a drive around your city to look at Christmas lights. Wear PJ’s, play carols on the stereo and take the Grandparents along. If 2 cars are needed, change combinations after each stop and talk to each other through walkie-talkies. Stop for a treat on the way or take hot chocolate in a thermos for the road. Buy disposable coffee cups with fitted lids for this purpose. Send out Christmas cards. Perhaps involve the children in making these. Maybe a photographic record of the years’ highlights with descriptions could be included, along with a hand-written note to personalise each one. 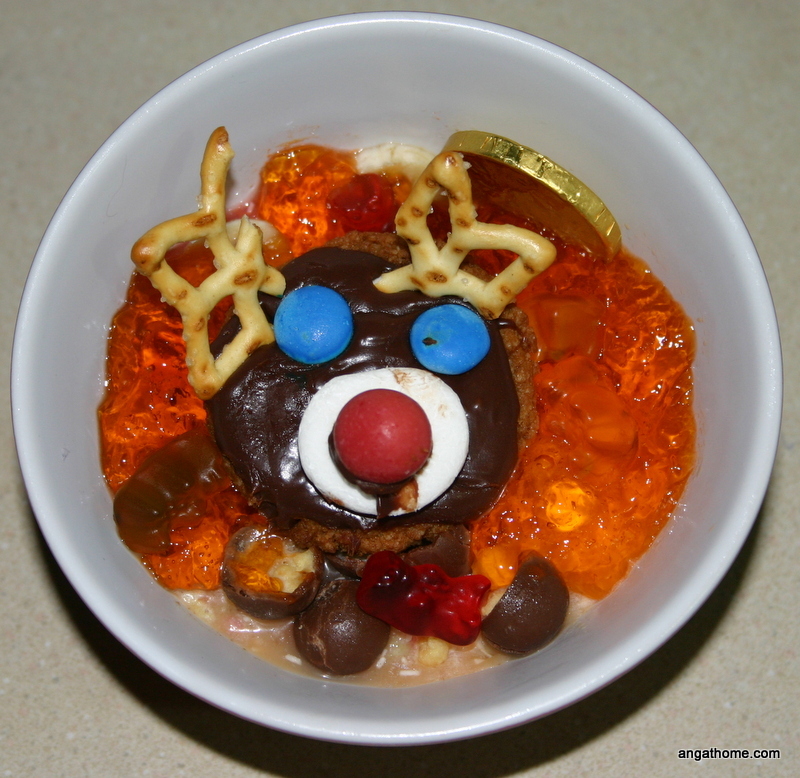 Make something for the neighbours; perhaps Christmas puddings, crafts, jam, rocky road or whatever your speciality. We like to include a flyer of Christmas day service times from our church and a small tract explaining the Christmas message and walk up and down the length of our street delivering them. This year we are making bead angel decorations. Knock & run nativity. The characters from the nativity set are delivered to a neighbour one at a time anonymously in the lead up to Christmas day with baby Jesus arriving on Christmas morning. The group effort turned out a surprisingly even tree. Only one or two branches had massive overloading and they were surreptitiously corrected by the eldest while little ones were busy collecting the next handful of decorations. 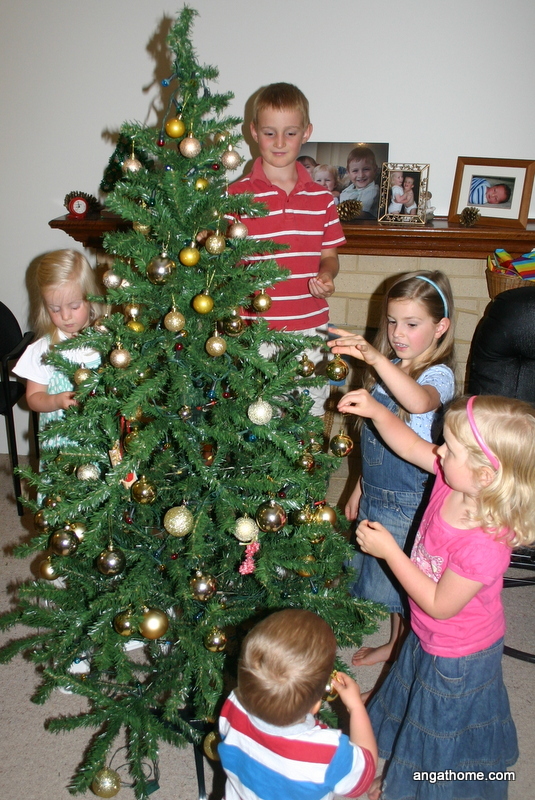 The tree is decorated on the 1st of December, with the children arranging it as they please while Mum and Dad take video and photograph the event. We also take individual and group photos of the Children in front of the tree for their own photo album memories and also for gifts, cards and other crafts. 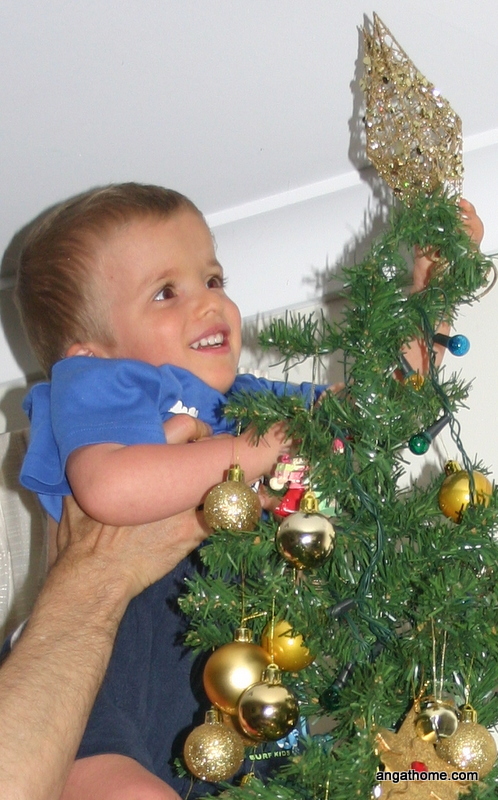 Christmas carols play in the background and the topping of the tree is saved for the youngest child who is able. Dad lifts them up while Mum takes the pics. Being a twin had us wondering if the “older” brother would miss out. His sister was technically the youngest last year and topped the tree. Luckily for him, the baby is not quite up to decorating just yet so he had his turn after all. 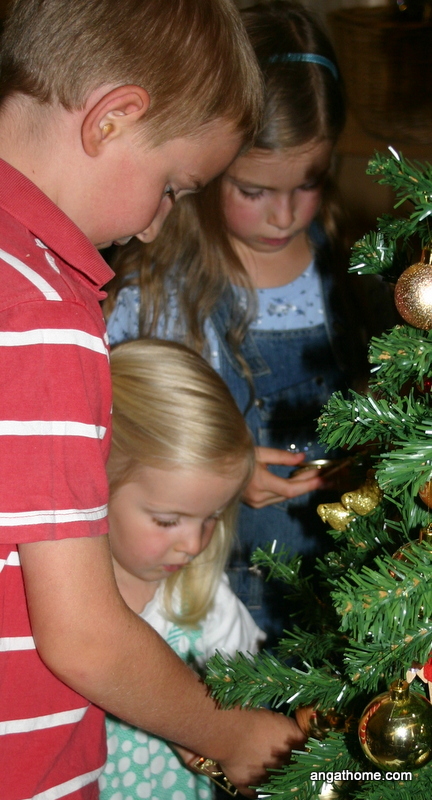 Some families purchase 1 new decoration for each child every Christmas and eventually give them to the children when they leave home to start their own Christmas traditions. The decorations may also symbolise something of significance from the year such as an accomplishment, interest or character trait. Christmas photos of the children can also be used for mini picture ornament frames or printed in black and white on clear vellum and placed inside hollow glass or plastic baubles. Craft advent activities mean that I get around to doing all those cute Christmas crafts the kids love.This year I prepared everything needed for each craft and placed it inside a brown paper bag with the instructions on the top. When craft time rolls around, all we need to do is pull down a bag and gather a couple of extra items like scissors and tape and we are ready to go. 25 activities was perhaps a little ambitious as we are a couple behind, but the kids are loving it. Next year I plan to link the crafts to the Jesse tree readings. One of our helpful “staff” members. For the second year, we held a high tea for older ladies from church just to bless them and thank them. All the fancy finger-food is prepared ahead and frozen to make it manageable on the day. The older children act as greeters and wait staff on the day and love every minute of it. Of course they get a lot of attention and fuss made of them so why wouldn’t they! When we were younger, our Grandparents slept over on Christmas eve so that they are there for the early morning festivities. Some families like to open one gift on Christmas eve or one gift only on Christmas morning before heading off to church. A new pair of PJ’s is a nice Christmas eve gift and means that the children all look good for Christmas morning photos. Family traditions have been built around particular videos being watched on Christmas eve or perhaps a games night with hot chocolate is something your family would enjoy. Our church now holds services on Christmas eve so that families who have very busy Christmas days can attend the night before. As Christmas cards arrive throughout December, place them in a little basket on the table and read them out before praying for the senders of the latest arrival that night after dinner. If you know of people with nowhere to go, you could invite them to participate on your Christmas celebrations. If you don’t have much planned, why not volunteer at a soup kitchen or one of the charity run Christmas lunches held around the city. In the past we have lucky dipped a name of a family member to make a Christmas gift for, rather than purchasing. Other years we have purchased only for the children, rather than the adults. Choosing one family gift for each family is another idea. (Tickets to a water playground with toys and snacks to share together, icecream Sunday or hot chocolate packs, adults & kids DVD with snacks etc.) This year we gave some families a set of our craft advent bags before Christmas as their gift. On Christmas day itself, we start the morning with our final advent reading and prayer. Later in the day we may have a birthday cake and sing happy birthday to Jesus. We try to spend some time in the lead-up to Christmas day role-playing & discussing gift receiving etiquette. (See “Receiving Gifts, Thankfulness and Good Manners”.) We discuss and act out scenarios covering what to do if you already have the same item, comments children can say to the gift giver once the present is opened, the importance of being truthful whilst respecting the thought, time, money and effort that the giver has gone to in order to give them their gifts, tactful ways to respond when the gift is not something they like, want or need & guarding their facial expressions when they see the gift for the first time. One side of the family like to give out the gifts at the Christmas day celebrations to one person at a time while everyone else sits and enjoys seeing what has been chosen. One person, often Grandpa, hands out the gifts to the youngest children first and works up by age. This means that the littlest ones can quietly play with their gifts if watching for the duration is just too much. The children sit on Grandpa’s knee to open the gifts while we all watch. A new idea we have heard this year to help set limits on the amount we buy for our own children is to model our spending on the 3 wise men; gold (bigger/want) myrrh (something to wear), frankincense (spiritual) or perhaps this little poem; Something you need, something you want and something to read. A friend of ours puts tags on the gifts under the tree in code so that the children can’t figure out who’s is who’s or what they are getting ahead of time. That, plus not putting the gifts under the tree until Christmas eve keeps everything a surprise. In the morning, part of the fun is working out who gets what gift. We choose not to include Santa or Father Christmas in our celebrations. Here’s why. The yearly Christmas day family photo is a must with all the extended family. Grandma’s fancy Christmas headgear, earrings and necklaces are becoming legendary and our children have begun to join in the fun at church with flashy headbands during Christmas services. Don’t forget to collect great recipes others serve you while out and about and get family recipes traditional for Christmas time (Nanna’s fruit cake etc.) written down before it is too late. In their own handwriting, laminated or framed is extra special after they are gone. Put aside a little time in the week after Christmas to have your own mini debrief. What did and didn’t work, things you want to do next year, what to change, ideas to remember etc. Through the year perhaps ordering some gifts online or in the after Christmas sales will save time and money for the following year. Maybe hand-made gifts can be planned so they can be made over the course of the coming year. Keep a list in your purse of items you have and a list of those you will be buying for and update it through the year as you see items on sale. Pick up your cards, wrapping and decorations on sale after Christmas. Don’t forget to post thank you cards from you and the children. Home-made cards are more meaningful but do take longer. Young children can dictate for you to write.